We like to call Lake Tahoe a “year-round playground” because, whether it’s the peak of summer or the dead of winter, there really is no shortage of things to do. From the too-good-to-be-true landscapes to the exciting nightlife, you’re sure to find something to love about this place we call home. If you’re planning a trip to the area, here are our top recommendations of things to do in South Lake Tahoe, CA. Lake Tahoe might as well be synonymous with skiing and snowboarding. Seriously. We have some of the best skiing in the world, hands down. Our position in the Sierra Nevada mountains means we receive several hundred inches of snow. Mix that with just the right amount of sunshine and you have the ingredients for a perfect ski trip! We happen to be located just steps away from the world-class Heavenly Mountain Resort, and we can’t think of anything more…well, heavenly. With 84 runs, 29 lifts, and 4,800 skiable acres for you to explore, there really is no better destination for skiing, boarding, and tubing. From ski lessons to equipment rental to child care, you’ll find everything you need to make the most of your trip. Hitting the slopes at Heavenly? 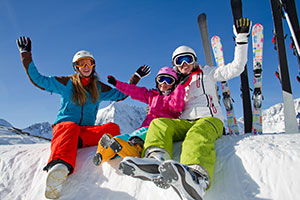 Check out our ski & snowboard packages! If downhill skiing isn’t your cup of tea, don’t worry. There’s also plenty of cross-country ski and snowshoe trails nearby. Whether you ski or not, you don’t want to miss the scenic Heavenly gondola ride for some of the best views of Lake Tahoe — period. The 2.4-mile ride up the mountain will leave you breathless. Grab your camera and take some time to slow down and enjoy the view. Go on a biking or hiking adventure. 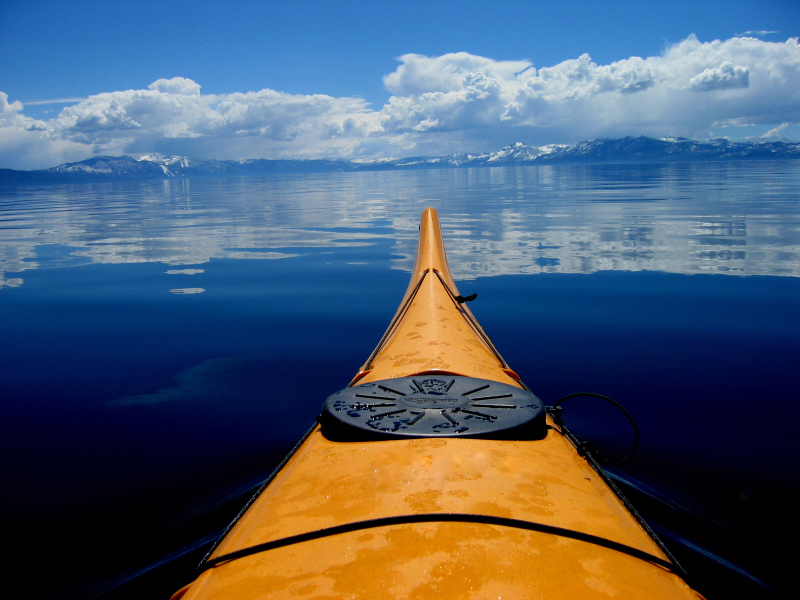 Besides skiing, there are numerous other ways to enjoy the picturesque landscape of Lake Tahoe. 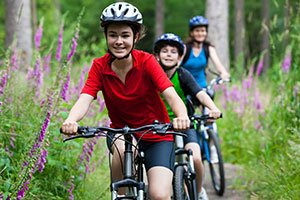 Hiking and biking expeditions are favorites of ours! If you’re looking for a long endurance run or all day hike, you have to visit the Tahoe Rim Trail. It’s about 165 miles in total, and every section is beautiful. Enjoy the wildlife, flowers, and groves of aspen, fir, and more. We recommend hitting the Bench — a section of the trail from Kingsbury to Spooner Summit. For a little shorter hike or run, explore Eagle Falls, which is only about two miles and has a good variety of steep and flat terrain, not to mention the beautiful falls. If you prefer exploring on two wheels, we’ve got you covered there, too. There’s plenty of great bike trails around here with a perfect mix of exciting mountain biking and easier terrain. Van Sickle Trail is right out our back door and across the street. It’s a great trail that provides some amazing views and easy to moderate hiking, biking, and horseback riding opportunities. Mr. Toad’s Wild Ride is another favorite among our staff and visitors.It’s close to the hotel and features a good mix of downhill, flat, and technical skill required. If bringing your bike and gear along with you to Lake Tahoe isn’t an option, that’s totally fine. There are plenty of cycleries and bike rental shops ready to get you on your way. When the weather warms up, it’s time to soak up the sun. There’s really nothing quite like escaping the hustle and bustle with a day at the beach. It’s the perfect family outing or fun activity with your pals or significant other. Keep in mind that a day at the beach in Lake Tahoe doesn’t just mean swimming. Many of the beaches around here offer kayaks, paddle boarding, boats, picnic areas, playgrounds, jet skis, live music, and more — everything you need to enjoy the water and gorgeous water views. There really are some great beaches in Lake Tahoe. It’s hard to choose a favorite. However, a few that we frequent include Round Hill Pines Beach, Baldwin Beach, Camp Richardson Beach, and Connolley Beach. Round Hill Pines Beach has plenty of sand, sun, and activities galore — including paddle boarding, beach volleyball, and more. Lake Tahoe Resort Hotel gives out passes to our guests for this beach. Baldwin Beach has about a 1/2 mile of sandy beaches and panoramic views of the Sierra Nevada Mountains. It’s great for swimming, picnicking, and kayaking. Camp Richardson Beach gives you great views of the Heavenly Mountain Resort and has great music, cocktails, and food options. They also have boats, kayaks, jet skis, and more available for rent. Nevada Beach is a US Forest Service beach, located less than 3 miles away. Full bathrooms, picnic facilities, on-site parking, BBQ stations and wide sandy beach (claims to be the widest on the lake) make this a local’s favorite. Remember to pack your sunscreen and enjoy the sand beneath your toes! Rock out and enjoy the stellar nightlife. If you play your cards right, you can experience both the natural wonders of Lake Tahoe and it’s exciting nightlife on the same day. Visit one our local casinos to try your hand at slots and all your favorite casino table games without all the Las Vegas hoopla. Or, feel free to dance and sing your heart out at one of the amazing shows happening all around Lake Tahoe! From karaoke to comedy nights to big name headliners, there’s a little something for everyone happening in venues year-round throughout the area. The Summer Concert Series in Lake Tahoe is a favorite each summer at the Lake Tahoe Outdoor Arena at Harveys. The 4,000 seat amphitheater is set to host the Dave Matthews Band and country star Luke Bryan this summer. Chat with our staff or check local venues for ongoing music and event lineups! Explore the area’s unique history. Our area isn’t just rich in natural beauty, it’s also rich in historical and cultural beauty as well. We definitely recommend you take some time to visit some of our top historical destinations while you’re here too! First, the Lake Tahoe Historical Society Museum is a great starting point for history buffs. The historical society and museum hold fun events all year long, including history camps for kids and a holiday open house. They also offer historical walking tours and a great selection of books and other resources! Be sure to stop in and learn more about our great area. Vikingsholm, a “hidden castle” near Emerald Bay, is another neat historical spot to check out. This gem was one of the first summer homes in the area, built in the late 1860s. Today it is part of the Harvey West Unit of the Emerald Bay State Park and open for tours during the summer months. The outside and magnificent scenery, however, can be viewed year-round. It truly is a shining example of Scandinavian architecture. And lastly, don’t miss the Pope-Baldwin Historic Estates at the Tallac Historic Site. The historically registered estate features the Baldwin Museum, Pope House, a beautiful garden, a blacksmith shop, and more! Browse the gardens, check out the vintage clothing and artifacts, view demonstrations, and learn about the area’s history from knowledgeable volunteers. Book your Lake Tahoe vacation today! 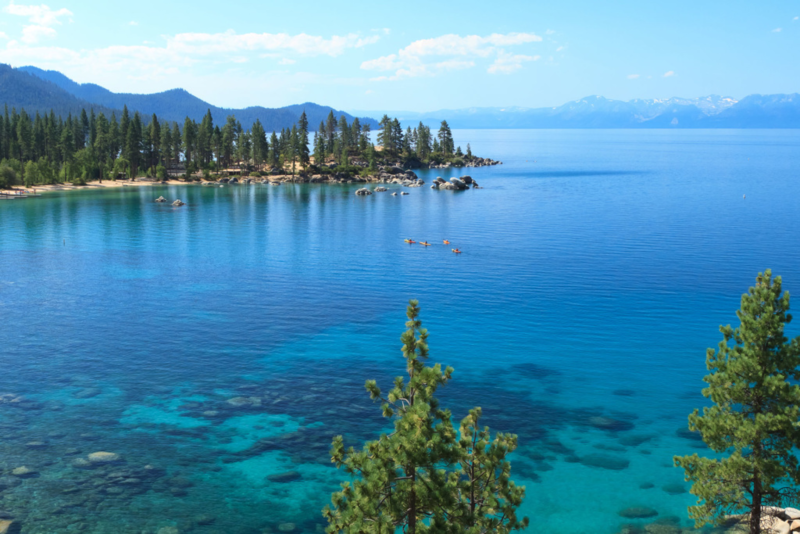 We’re only scratching the surface of what Lake Tahoe has to offer. Check out our full list of attractions for even more exciting year-round activities. 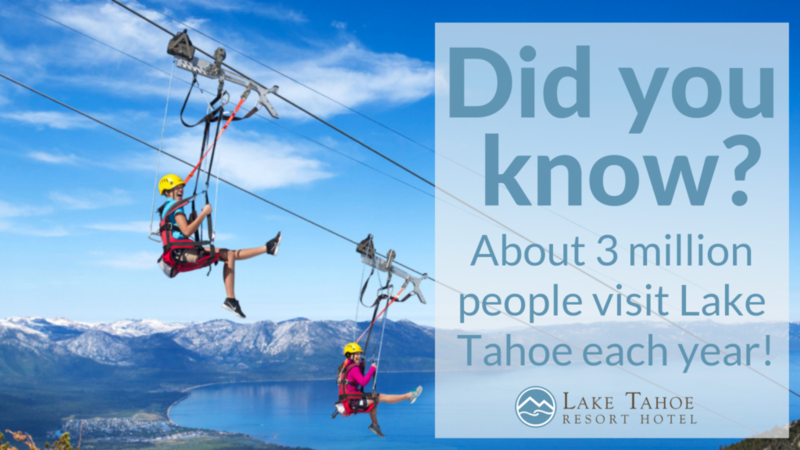 Better yet — book your stay at Lake Tahoe Resort Hotel and come see for yourself!